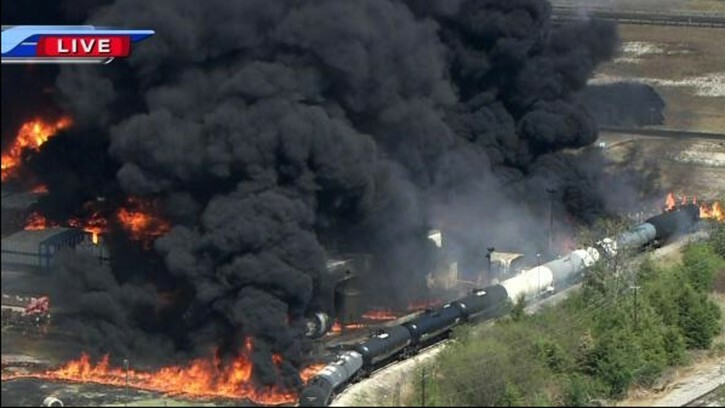 Waxahachie, TX - A fire at a chemical plant south of Dallas shot massive plumes of black smoke and bright orange flames into the sky Monday, forcing schoolchildren and residents to evacuate or take cover indoors to avoid possible exposure to dangerous gases. Flames engulfed what appeared to be several areas of a large complex at a Magnablend, Inc., facility in Waxahachie, about 30 miles south of Dallas. Images from local television stations showed the fast-moving blaze consuming a fire truck at the scene and flames nearing railroad tracks alongside the property. Magnablend spokesman Donald Golden told WFAA-TV that the 25 to 30 employees who were inside a warehouse at the plant evacuated safely when the fire broke out. Golden said the company manufactures about 200 products, including some that are hazardous when ignited. “I can only speculate on what’s going on inside that building right now,” Golden said of the 100,000-square-foot warehouse. Waxahachie Police Lt. Joe Wiser told the Fort Worth Star-Telegram no injuries had been reported since the fire was first called in about 10:40 a.m. Authorities ordered residents closest to the plant to evacuate, while others were advised to stay inside. Ellis County emergency management officials issued an evacuation order for an apartment complex, an elementary school and a junior college. Sheriff’s officials urged residents not to drive toward the area of the fire. Waxahachie Independent School District spokeswoman Nicole Mansell said Wedgeworth Elementary School students had been safely bused to another school’s gymnasium by 12:25 p.m. Navarro College cancelled all classes for its 2,500 or so students, school president Dr. Richard Sanchez told the Star-Telegram. The Texas Commission on Environmental Quality was setting up air monitoring equipment to gauge whether further precautions were needed, said agency spokeswoman Lisa Wheeler. She said the company has been in compliance with its state permits. Magnablend Inc. manufactures, blends and packages chemicals. Much of its business revolves around energy production, including chemicals used to stimulate oil and gas wells and hydraulic fracturing. The company was launched in Waxahachie in 1979 and now employs about 250 people, with operations in Pennsylvania, Wyoming and North Dakota as well as Texas. wow, that is a massiva fire..